You don’t have to edit your documents using one software, and send them out using another. You can email your PDFs directly from PDFfiller. If you edit and email a dozen documents a day, PDFfiller might save you a lot of time. You can send the entire document or only some pages. Select the pages you want to send in the page preview pane, use Select All and Unselect All buttons. Finally, press the orange Send Email button in the top right corner of the page. The recipients will receive your email with a link to the document on PDFfiller; they will not be able to edit the document but will be able to save, print, send, and fax it. If you like being able to email documents from PDFfiller, you might be interested in a whole lot of other great features that PDFfiller has to offer. Some of these include editing, annotating, signing, faxing, and sharing documents. Check out these tutorials to see the other great things that PDFfiller can do for you! Yes. You can send fax via PDFfiller.com. Select the document you want to fax and click the "Fax" button on the "My Forms" page. Input a local or toll free number and click the "Send" button. You'll receive email notifications when your fax is delivered and received. How can I fax document without fax machine/ how can I fax online from my computer? You can send a fax via PDFfiller.com. Select the document you want to fax and click the "Fax" button on the "My Forms" page. Input a local or toll free number and click the "Send" button. You'll receive email notifications when your fax is delivered and received. Can I fax to someone outside the U.S.? No. With local or toll free numbers, you can only fax document inside US. Please contact us for more information regarding fax limitations. You can view the status of your fax by clicking the "History" button on the "My Forms" page. This will show the status of and history of all your documents, including faxes. You will also receive an email notification when your fax is delivered and received. Faxing may take up to an hour. You will receive an email after the fax is delivered and received. You can track the status of your fax document(s) by clicking on the "History" button on the "My Forms" page, and then clicking the "fax" button. This will show the status of all your faxed documents. 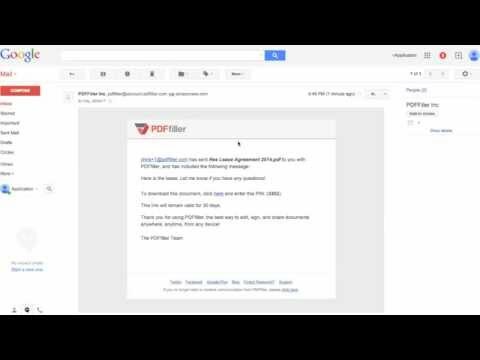 PDFfiller.com will also send you email notifications when you fax is delivered and received.